In the past, it’s possible that you or a previous owner of your domain paid for inbound links in order to boost your site’s SEO. This was once a common practice, but is now something websites can get severely penalized for. Links from sites with bad reputations can do serious damage to a website’s ranking in search engines. And if you operate a small business or e-commerce shop, these loathsome links could significantly affect your livelihood. That’s why, if you’re serious about your SEO, it’s important to check your site for bad links and learn about disavow files. To start finding out if you have any harmful links pointing toward your site, your best bet is to use Google Search Console (formerly Google Webmaster Tools). If you haven’t already set up an account on the Search Console, take the time to do that now. Here you’ll find tons of helpful utilities for webmasters, including a tool that lets you download a list of links to your website. (Look for that under Search Traffic and then Links to Your Site.) Now it’s time to take a look at who is linking to your site. Although there are a handful of free and paid bad link checkers claiming to identify your bad links, there’s truly no quick way to determine which of your inbound links might be malicious. This is because Google and other search engines don’t make their lists of offensive sites publicly available. So it’s up to you to go through your downloaded list of links one by one, and carefully consider each URL. Depending on how many links you have, it could take you a while to go through them all. Still, though, visit each link and make a note of which ones seem spammy or suspicious in any way. The next step is to disavow the sites that are probably doing you more harm than good. Once you’ve compiled a list of possible offenders, it’s time to decide which ones you’ll disavow, meaning which ones you want to eliminate or renounce so they no longer factor into search engines’ evaluation of your site. But because you don’t know with certainty which of your backlinks may be counting against you, don’t start disavowing sites willy-nilly. Rather, do some research on SEO forums for advice about which links are likely dragging you down. In general, sites that offer very little value to the visitor can be considered corrupt candidates. If you’re absolutely certain that an inbound link is doing more harm than good, try contacting the webmaster of that site and ask them to remove it. This is the most effective route, but not always the most realistic. If you can’t find who to contact, or simply get no response, you may have to take matters into your own hands. When that becomes the case, Google’s Disavow Links tool can be used to remove bad links from your link profile, and improve your overall ranking. Sometimes, you just have to roll up your sleeves and do the dirty work, yourself. 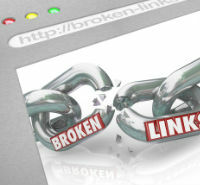 Don’t wait another minute to find out if your site is receiving some nefarious links. Follow these steps to make sure your SEO sparkles. Eager to learn more about boosting your site’s visibility? Explore our extensive library of articles now.